Got up and left campsite in Monkey Bay in the morning and headed towards civilization. We connected by bus through Belmopan and showed up in San Ignacio in the early afternoon. We knew it would be our last stop in Belize before heading to Guatemala. We had heard from a few people about the ATM tour, so that was our main goal, but we also knew from the local guy we met back in San Pedro that there were some cool ruins nearby that we could visit. With only 3 days left on our Visas that gave us just one extra day of leeway. When we first arrived in San Ignacio, I got a bit turned around trying to figure out my map, but we figured it out pretty fast and went to a place called the Hy-At. I guess it sounds good when you say it, but it really was just a hostel in town run by a local family. We had a nice room with a bathroom and fan for BZ$30. The town itself was had a really good vibe right from the start. There were lots of people and stores packed into the small centro area. It seemed like a lively and safe town and I could tell it was my kind of place. I guess Belize City and even Orange walk might have seemed bigger, but San Ignacio seemed much more like a city where people walk around at all hours and foreigners are happily approached rather than stared at like dollar signs. We wasted no time going out to look for places offering the ATM tour...there were only a couple in town so we were able to book it pretty easily. Afterwards we went in search of a decent burger (i.e. not rice beans and chicken) and found a great place that had decent food, but also served beer in a nice, ice cold, frosty mug! Wow, just like many bars back home, especially my favorite little place in Houston, La Carafe. Back at the hostel we met a cool Canadian couple, A.J. and Jaymie that were doing a few weeks in Central America. Sadly, they were at the end of their trip, but did give us a few suggestions about some places to hit. We ended up going out to look for food and then went to a bar called Faya Watta. I think I covered this back in the Caye Caulker journal, but the creole/English that they use here never stops cracking me up. We didn’t stay out too late because we had to do the ATM tour the next morning. Today was one of the best days of the trip so far!! It definitely was the coolest tour we have done. We hesitated quite a bit because it was $70 USD each, but we had been assured by atleast 3 or 4 different people that it was worth every penny and we were not disappointed! 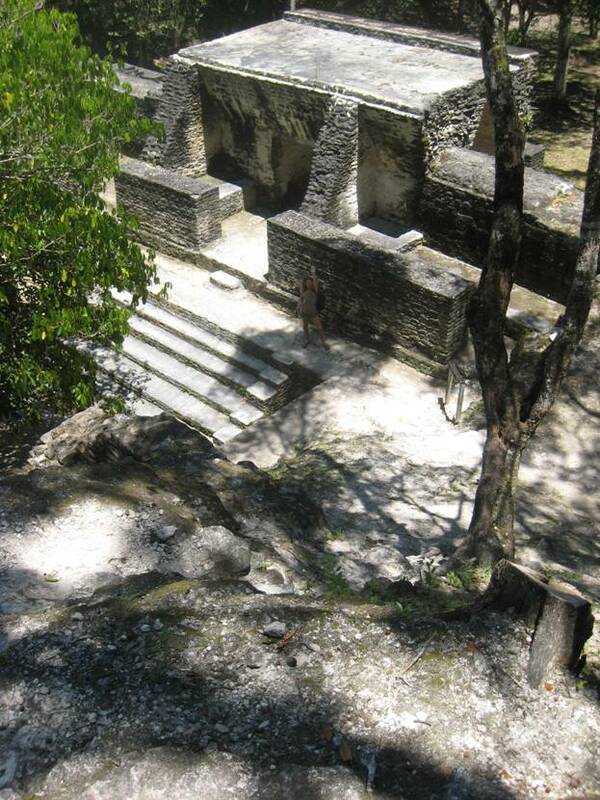 The tour is called the ATM tour, (short for Actun Tunichil Muknal) and it takes you on one of the best journeys to one of the most amazing archeological finds in all of Mayan country. Wait...I don’t want to get ahead of myself. I’ll take it from the beginning. We got to the tour office at 9:00 to catch our bus. There were about 8 other people that went on the tour with us. This has nothing to do with the tour but there was something interesting that happened after we got in the bus and tried to leave town. We were parked on a one way street that was relatively busy...but also quite narrow. Parking is still allowed on one side of the road and their were several cars on that side. Somebody had taken it upon themselves to park their car overnight on the wrong side of the road. There was just barely enough room for cars to still get by, but our bus proved to be slightly too wide. What was interesting to me, as I watched the bus driver trying to get out was that everybody...and I mean EVERYBODY who was walking by on the sidewalk and opening up their shops became involved in trying to guide the bus driver past the tight squeeze. It was a tiny little problem that is not so uncommon in any city in the world, but the reaction was quite different. Living in the North End in Boston, I saw something like this happen almost every single day. The difference was there wasn’t 10 minutes of laying on the horn and screaming obscenities, and nobody just walked past and went on their way. There was no tow truck waiting to hall the guy away and then charge him $120 (how long are we going to let the tow companies get away with these ridiculous rates by the way). There were literally 20 people involved with trying to solve the problem and nobody got angry. Some people even ran up to a nearby hotel to see if the person who parked on the wrong side of the street was from there. Eventually, another guy got in the bus and reversed while others backed up traffic and we backed all the way down the road to the main intersection and turned around. He and the driver and many others simply exchanged smiles and handshakes, we received several thumbs up gestures and then we were on our way. Nobody’s morning was ruined (including the guy who was at fault for parking on the wrong side of the road) and nobody thought anything of it really. I feel like this simple story reflects a lot about what I love about being in latin America. There’s a friendly, helpful way to this culture that makes you wonder why everybody doesn’t act that way...and I love that. Of course, it’s not like this everywhere, but it’s nice to see it when it happens. It just gives you a little more faith in humanity. Anyway, we were off to start our tour...we drove for about an hour and half outside of town, the last 15 minutes of which were down a very bumpy, unpaved road. We had to cross a river a few times and I’d say a larger bus type vehicle would be the only way to get into the park where we were going. When we arrived, we piled out and got ready for our hike, which we had been told would be about an hour. We would be out the whole day and only carried a few things, our lunches (provided), water, cameras, and they also had stressed to us several times to bring an extra pair of socks (I’ll explain this in a minute). Off we went on our hike, which was pretty nice. 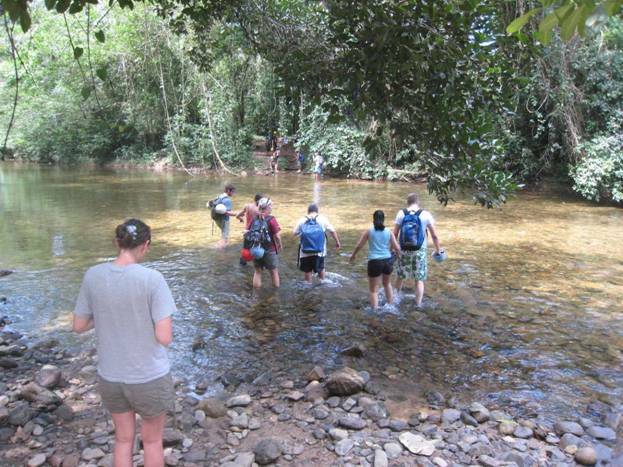 We had to cross the river a few times but it was relatively shallow. The forest itself was cool...we saw a lot of the same things we had been seeing...cohune palms, ceiba trees, lots of leaf cutter ants, chicle tree, etc. Still, it’s always nice to be out in the forest down here and it was a fun little hike. Eventually we reached the old base camp that the cave mappers and archeaologists had used when this area had been discovered. I say “camp” but it was nothing more than a clearing in the woods with a small shelter set up that had a few picnic tables under it. It was probably about noon by then so we decided to have lunch before continuing on. Our guide, Renan, was of Mayan decent (as many are from this area) and pretty knowledgable about the history of the Mayans and particularly of the ATM site. He had actually been one of the locals who helped archeologists map the cave back in the late 80’s and early 90’s. 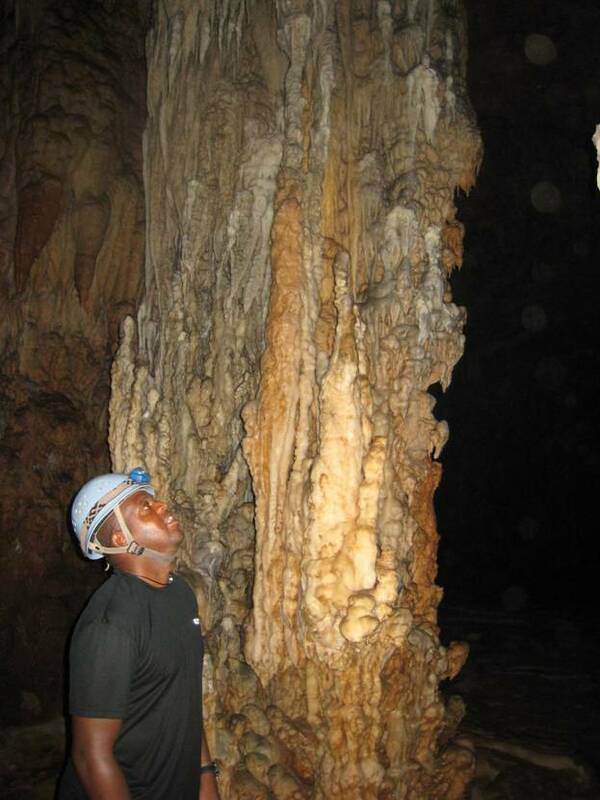 He told us long involved story about the sanctity of the cave and how the Mayans viewed them as portals to the underworld. I’m not even going to attempt to retell the whole story...I wish I could have recorded it all because it was very interesting. After learning some history, it was time for us to head into the cave. Just arriving at the entrance was pretty breathtaking...it was beautiful (and maybe a little scary)! We all took several pictures in front of the cave before passing our cameras to Renan who carried them all in a dry, waterproof bag. We dawned our helmets and head lamps and off we went! Right from the start we were neck deep in the freezing cold water, wading through the entrance to begin our trek! 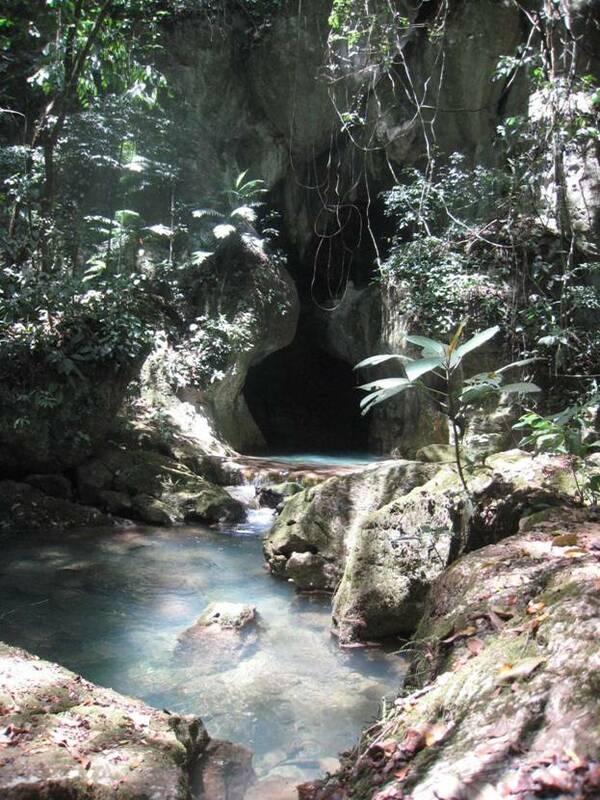 We would spend the next hour hiking through the cave as the water level varied from ankle deep to “start swimming”. We took so many twists and turns and squeezed through some pretty tight openings. The deeper we went into the caves, the more I wondered how in the world the Mayans would ever find this. Even as a guide it would have taken me months to learn my way...it is pitch black and there are times when you have 4 or 5 different choices on which direction to go. Anyway, this part of the tour was pretty amazing and we had yet to get to the best part. The cave was filled with beautiful limestone stalactite formations and it was quite the adventure just being in the belly of the mountain. The caverns go on for many, many kilometers, but only 5k of the caves have been mapped, and even that took several years! We didn’t go quite that far however...after an hour my guess is that we had gone maybe 1k. From that point, we had to climb up a pretty steep rock and into a HUGE chamber. It was short but not easy...my guess is that some “less fit” people get that far and don’t make it up so beware. In fact, when we arrived, there was one older lady who was in that exact situation...she was waiting at the bottom for the rest of her group to come down. From that point forward, to keep everything as preserved as possible, they ask people to remove their shoes and only wear socks. The reason for that is that, over time, the oils from our skin can damage the rocks and any artifacts you might accidently step on. The same thing happens with our hands so we were asked not to touch the cave walls during most the hike through the cave. They stress this over and over again when you book the tour, they remind you before you get on the bus that morning, and then AGAIN when we get off the bus at the entrance. We were told no less than 10 times to bring an extra pair of socks and that we would have to wear them in the Chamber. Even after all that there was STILL one girl who did not freaking wear socks or bring any! People are so stupid sometimes it drives me out of my mind. There was no excuse. The guide let her come in the end since she paid so much and had come 95% of the way but if I was him she would have been SOL. When we got into the chamber I couldn’t believe the size of it. There was Mayan pottery everywhere! There was so much it was tough not to step on pieces of broken pots. They even put red tape down in some places so you would not accidentally step on something. There were artifacts everywhere! 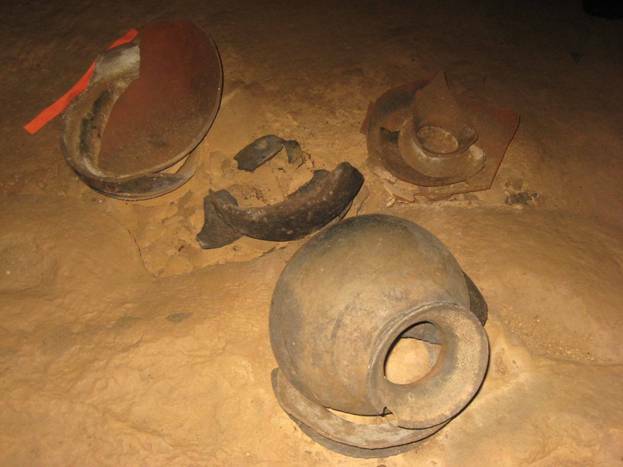 It turns out that the archeologists who discovered the cave decided to leave everything there exactly as they found it. It really was impressive. You might notice from the pictures that all the pots are broken...Renan explained to us that, for the Mayans, even inanimate objects had souls. That meant that they had to be broken so their spirit could be set free or they would be trapped in the underworld forever. Interesting. He also stressed how everything he was telling us was his interpretation (or rather that of his family) but there is alot about the Mayans that nobody knows for sure (for example, there seems to be quite a bit of debate on whether they kept slaves or not). He did a great job of explaining a few different view points when it came to some of the more debatable aspects of the Mayan culture. I really liked it about him...he was one of the best tour guides I have ever had so request him if you can. 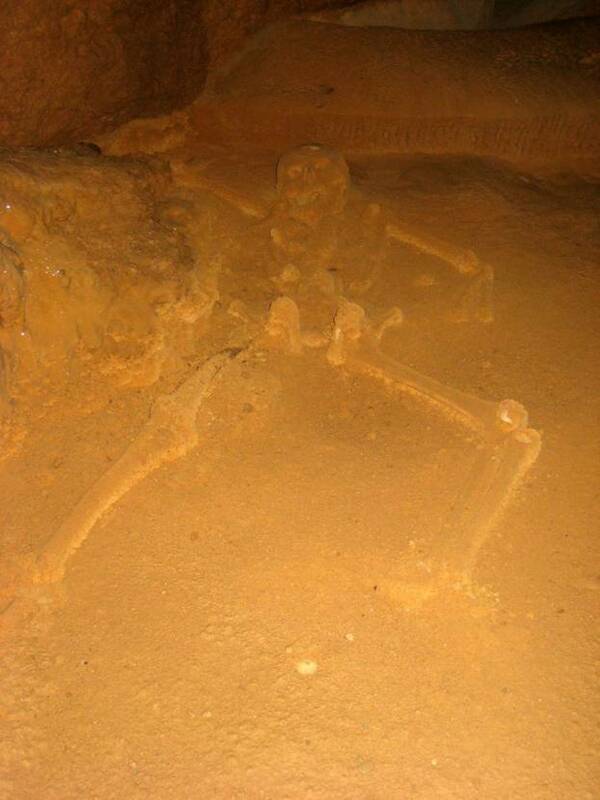 Besides all the artifacts, there were also the remains of 15 humans in the cave. There were a few adults but most of them were children. Most things we saw were covered in sediment from the cave and only partially exposed, but you could still see lots of skeletal remains. It was actually really interesting...it makes you wonder the story behind the Mayans, how they ended up here and what they did here. 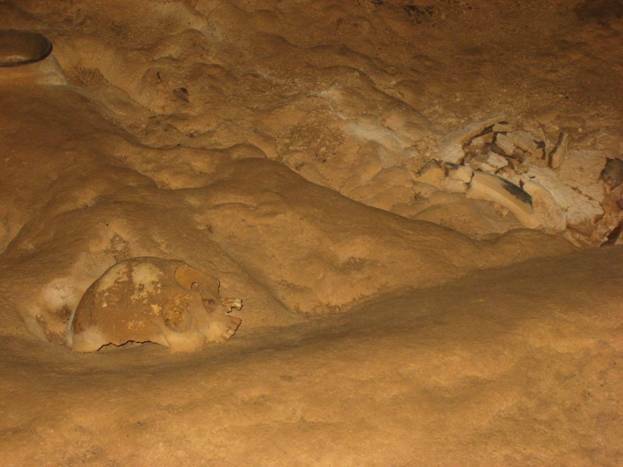 This cave provided as many clues as it did questions. We walked along the path, seeing many artifacts and skeletons as I said and then the path opened up into a huge chamber that I could only describe as something like an amphitheater. It was easily the size of a football field and the ceiling must have been 80 feet high. There were tons of cool rock formations that formed floor to ceiling “pillars”. From there we went to one end of the chamber and climbed up to the highlight of the entire excursion, the Crystal Maiden...a fully intact skeleton of what is thought to be a 17 year old girl. A little eerie but so amazing. That night in the hostel all we did was talk to everybody about the how awesome the tour was. We had a few beers with Jamie and AJ...and as if they day hadn’t been cool enough, I finally learned how to open beer bottles with a lighter. Sweet...only about 12 years too late. Not too much happened this day...I had to take care of a few things from back in the USA so I made a few phone calls and wasted a ton of money being on hold for various reasons. The only good thing was that I had some time left on my calling card at the end, and since we would not be in Belize much longer I had to use it. I ended up talking to my friend Mike for almost a half hour which was pretty cool. Between the phone calls and internet, I killed pretty much the entire day. Jodi had spent the day browsing around through some of the shops and was able to find a really good picture book on the wildlife of Belize and Guatemala. We really could have used it for the past month, but atleast we’ll have it for the Guatemala. We spent most of the night in the hostel talking to Tracy and Nick/England, a cool couple who were basically doing a short version of the exact same trip we were on. They had only begun a few weeks before in Mexico City and they were headed through Central America. Cool...we figured for sure we’d be seeing them as we continued on. We even talked a bit about doing some of Guatemala together. They were heading out to Flores the next day but we still had one day left and wanted to see the Cahelpech ruins. We exchanged emails with them and promised to meet up in Flores. I didn’t have any notes in my journal from this day but it was a great end to our time in San Ignacio. We went to the Cahel Pech ruins with Jamie and AJ/Vancouver. This is a great thing to do if you’re in San Ignacio...the ruins are a short $3 cab ride up a steep hill just outside of town. You could definitely walk it, but I would suggest taking a taxi up and walking back down like we did. It was actually one of my favorite days visiting ruins on the trip so far...the place was impressive, but more importantly, we were the only ones there the whole afternoon. We climbed on everything and went into all the different rooms and had a great time. We took a bunch of cool pictures so check them out. They also had a really good museum at the entrance to the ruins. We are seriously becoming experts on the Mayans! That night Jodi and I went to Faya Watta again...it was just okay as the live music was horrible. We had been in Belize for 29 days and I can’t believe how much we did! I would have to argue that you would be hard pressed to find a country that’s this small with so much to offer! We got to do some of the best diving in the world here, we spent a bunch of time out in the rain forest and saw some great wild life, AND there are some spectacular Mayan ruins to visit. Belize is definitely an awesome country and we relished our experience here. Tomorrow it will be on to our third country...Guatemala, which I’m sure will not disappoint.